Krishnanagar, June 26:State BJP president today reiterated again that his party principally supports the concept of small state, but not supports the demand of Gorkhaland as separate state. He also made it clear that the state BJP would defend any effort to extract Gorkhaland from the existing structure of West Bengal if any such situation arises in the future. Speaking at a public meeting in Krishnanagar today Ghosh claimed that the BJP had never talked about Gorkhaland and had never supported the demand for statehood of Gorkhaland on the basis of any linguistic group or community. “The demand of Gorkhaland based on a handful of linguistic groups residing in a very small physical location is an absurd proposition. We, therefore, never supported this claim. But consecutive state governments in West Bengal kept the demand alive in the names while forming administrative wings like Darjeeling Gorkha Hill Council or the recently accorded Gorkhaland Territorial Administration“. “If the demand for statehood of Gorkha Janamukti Morcha’s Gorkhaland is accepted, days will not be far away when small ethnic entities like Kamtapuri, Rajbanshi would also press for similar demand. A large number of Gorkha also live in Assam, who may also raise the same demand there”, he said. Ghosh, however, preferred to leave the issue for final decision to the central government. “It is the centre to decide whether any new state needed to be created as demanded”, he added. 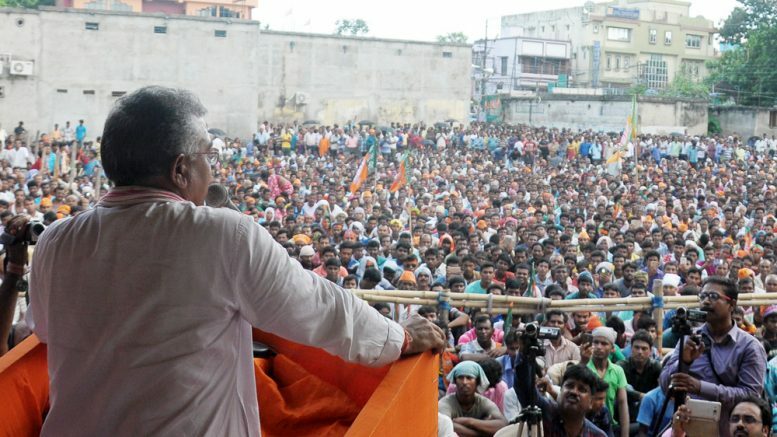 Dilip Ghosh later had spoke at a public rally in Duttapula.